On 18th June 2013 HSC Innovations in conjunction with Invest NI and the UK Intellectual Property Office delivered a workshop on ‘Protecting and Exploiting Intellectual Property in Healthcare’. There were over 60 delegates from health sector companies, clinicians and researchers from throughout Northern Ireland who participated in the interactive workshop to learn how best to protect and exploit their Intellectual Assets. Olive Hill, Invest NI’s Director of Innovation and Technical Solutions, welcomed the delegates and explained the importance of protecting and exploiting intellectual property (IP) in the healthcare sector, which is a successful and growing part of the Northern Ireland economy. Chris Smith, Intellectual Property Office, covered copyright, confidentiality, design, trademarks and patents, and included a number of healthcare examples. a company’s patent portfolio as well as protecting proprietary technologies is more than often a significant asset on the balance sheet. Like any other asset it requires constant maintenance and will frequently come under attack from the outside of the company environment. A strong and well maintained portfolio is not only protecting your technology but can be used as financing collateral and is likely to be a key factor in any future equity deals or takeovers. The big buzz in healthcare today comes from two new drivers – new national strategies, such as Transforming Your Care, espouse moving the point of care for the application of healthcare intervention from the hospital to the community, from clinic to couch. The second driver is connected health, which promises to revolutionise integrated healthcare across the globe. Both of these drivers will depend heavily on technology, including hardware and software, as key components in that revolution so, all of us involved in developing and delivering innovative solutions should pay even closer attention to the management of our intellectual property. Michael Caulfield, Olive Hill, Dr David McEneaney and Dr David Brownlee holding a portable defibrillator, the forerunner of which was invented at the Royal Hospitals, Belfast. A dynamic medical device and biotechnology sector is essential for the Northern Ireland economy. Encouraging collaboration between industry, academic and healthcare partners promotes an environment where research and development can lead to novel products and processes. Commercial exploitation can only take place by recognising and protecting IP at an early stage. A true collaborative partnership maximises the research capabilities of the team members, ensures delivery of project objectives and protects IP. David Stewart, HMRC, provided delegates with a comprehensive overview on R&D Tax Credits and the recently introduced Patent Box legislation, which can enable companies to apply a lower rate of corporation tax to earnings from patented products. Lynsey Mallon and Karla Dooey from Arthur Cox outlined the challenges of commercial exploitation of intellectual property through licensing negotiation tactics. 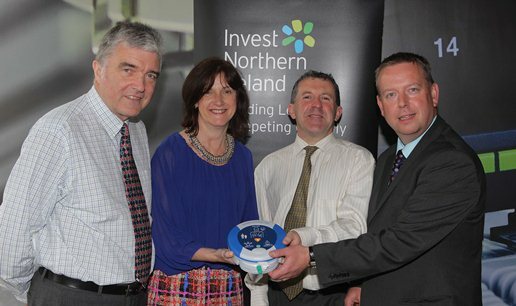 Invest NI then highlighted the support that they could provide in areas such as finding partnerships for technology and R&D projects through the Enterprise Europe Network, and the advice and financial support available for intellectual property protection and exploitation. For further details on the workshop, including the presentations see Invest NI on YouTube.